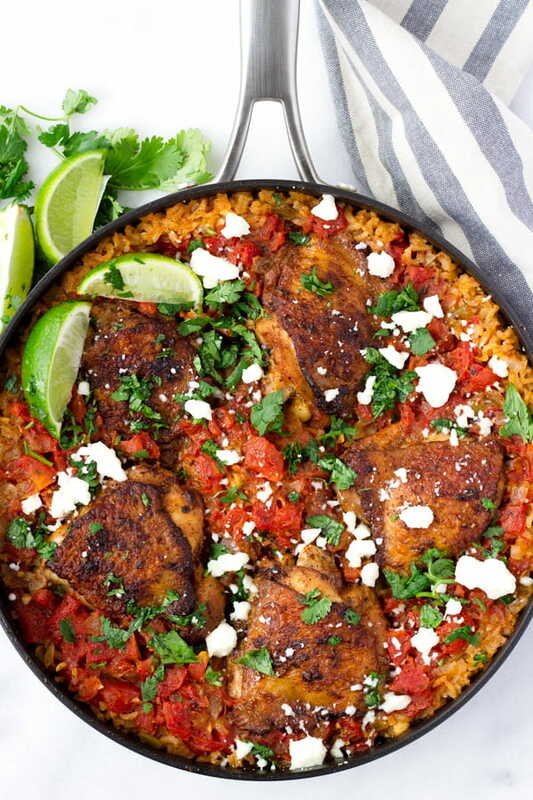 This one pot Mexican Chicken and Rice is a weeknight dinner winner! 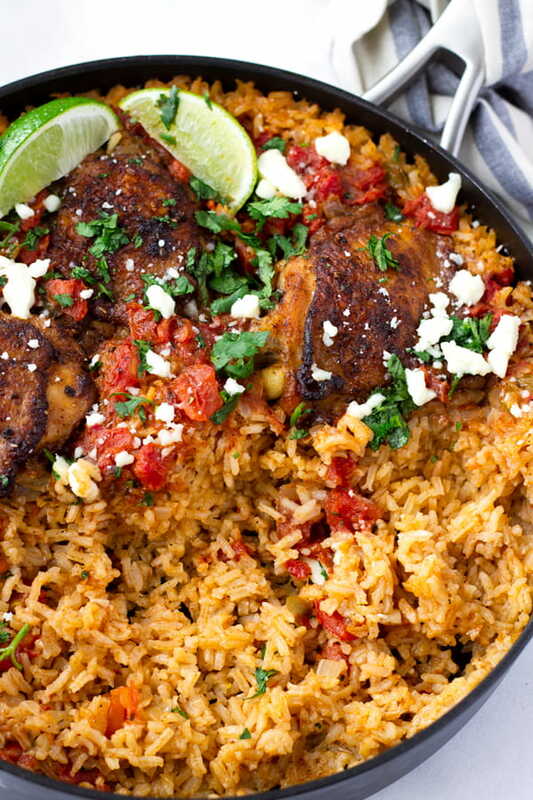 Seared seasoned chicken thighs on a flavorful Mexican-style rice. It’s basically the perfect one pot weeknight dinner. I love easy one pot recipes because it’s comforting and so easy to clean up. 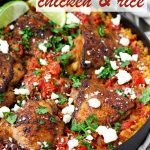 This one pot Mexican chicken and rice recipe is one of my favorite because of the explosive flavors that come with it and the the fact that it’s simple and delicious. I’m so excited to share this Mexican chicken and rice recipe with you today! I’ve made it a few times already, and every single time I am reminded on how comforting it is. 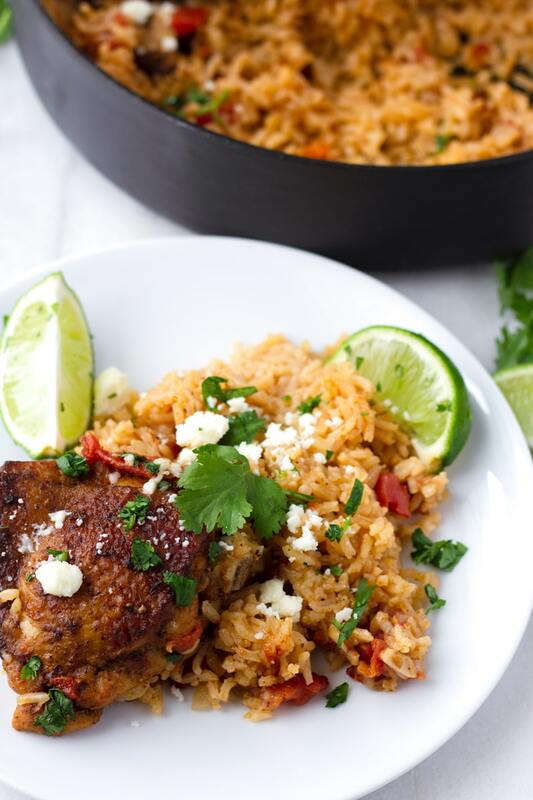 I love Mexican chicken recipes for dinner…tacos, quesadillas, burritos and all that delicious stuff, but seriously, this chicken and rice dish is at the top of my list. If you know me well, you’ll know that I love seasoned rice and chicken, so this combo with a Mexican flavor profile is just perfect. We’ll run through this Mexican chicken and rice ingredients next so you have an idea of how delicious it is! The key for a flavorful rice is to sauté the onions, garlic, and rice with the browned bits that the seared chicken thighs leave. So, don’t completely wipe the skillet after searing the chicken! In a large Ziploc bag, add the chicken thighs, olive oil, and spices (chili powder, cumin, paprika, oregano, garlic powder, salt and pepper). Seal bag and shake to coat well. Let marinate for 15-20 minutes. 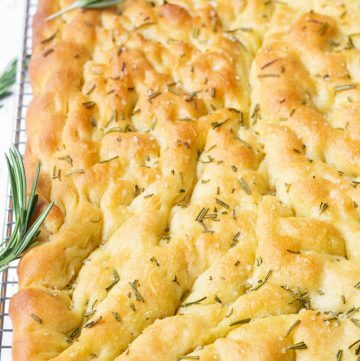 Heat some olive oil in a large deep oven-proof deep skillet or Dutch oven to medium-high heat. Make sure the skillet has an oven-proof lid too. Sear chicken thighs on both sides, skin-side down first, 3-5 minutes per side or until golden brown. Transfer to a plate. Chicken will not be fully cooked at this point. 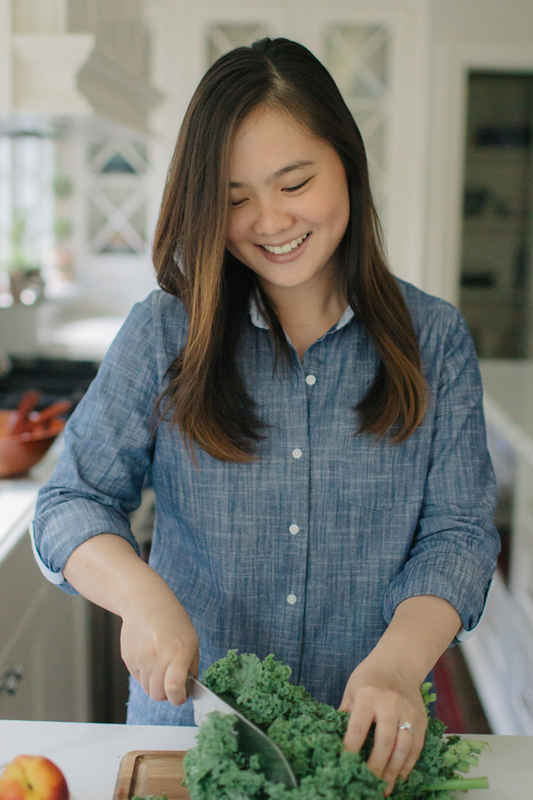 Tip: give each side time to sear and develop a golden brown crust by not flipping too early. Reduce heat to medium. At this point, the skillet or Dutch oven will have browned bits, so don’t wipe the skillet clean! If there is too much oil, drain some out. Add diced onion and garlic, seasoning with salt and pepper, and cook until fragrant, about 3 minutes. Add rice and tomato paste, stir and cook for a few minutes. This is called “toasting” the rice, which brings out the rice’s nutty flavors and adds flavor. Tip: Make sure that the rice is thoroughly rinsed as this will remove the some of the starch and enhance the final consistency of the rice. The grains will be more “separated” and less sticky. Add can of Rotel tomatoes and chile. Stir. Add chicken broth and stir to combine. Adjust salt and pepper if needed. Then bring to a boil, without stirring. Why? Stirring often only creates sticky and mushy rice. Nest chicken thighs on rice, until just submerged. 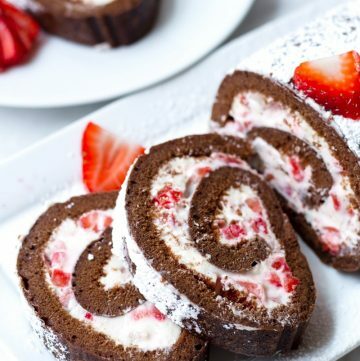 Cover with an oven-proof lid and bake about 30-35 minutes. Uncover, and bake about 15 minutes until all water is absorbed and top is golden brown. Let sit for 5-10 minutes to let steam escape. 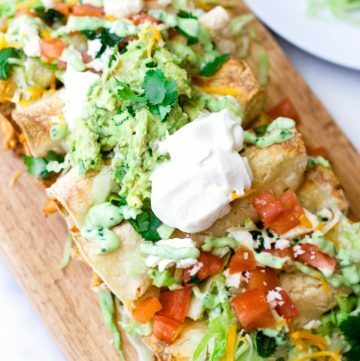 Garnish with cilantro, queso fresco, and lime wedges. Seems like a lot of steps to make this Mexican chicken and rice, but it’s not really. It’s super easy. The hardest part is just waiting for the rice to cook! I get a lot of questions about how to cook rice. How do I prevent rice from sticking? How do I make rice so that it’s not mushy? First of all, you need to get the rice water to rice ratio. Each type of rice needs different water quantities. For long grain rice, which is what this Mexican chicken and rice recipe uses, always go for a 2:1 ratio; 2 cups of water or liquid for every cup fo rice. Rinse rice thoroughly before cooking. This will remove some of the starch. After cooking the chicken, don’t wipe the skillet clean. Only remove any excess oil. The brown bits that remain after searing the chicken will add deep flavors to rice. Do not stir the rice too much while it’s cooking or you’ll end up with mushy rice. For long grain rice, use a 2:1 liquid to rice ratio. 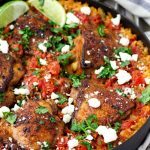 One Pot Mexican Chicken and Rice is a weeknight dinner winner! 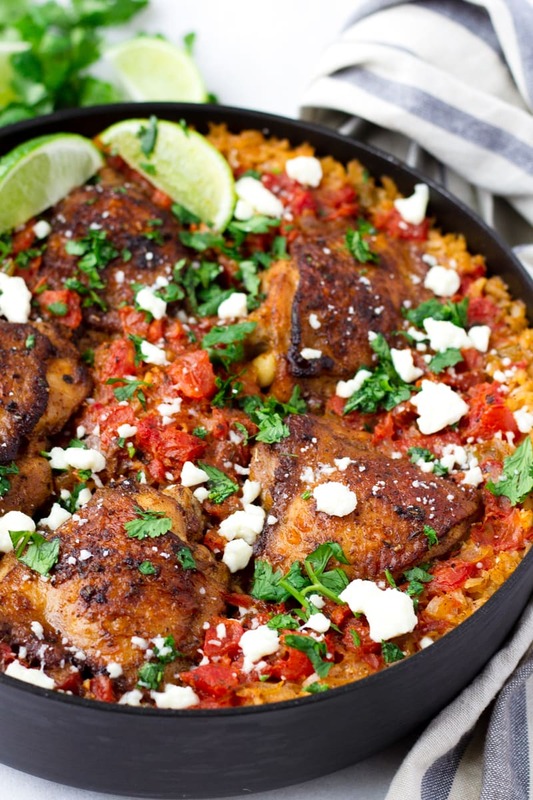 Seared chicken thighs seasoned in delicious spices on authentic Mexican rice. 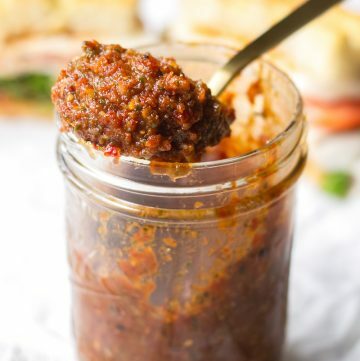 Seasoned chicken: In a large Ziploc bag, combine chicken thighs with olive oil, chili powder, cumin, paprika, dried oregano, garlic powder, 1 teaspoon Kosher salt, and 1/4 teaspoon ground black pepper. Shake to coat. Let sit in the fridge for 15-20 minutes. 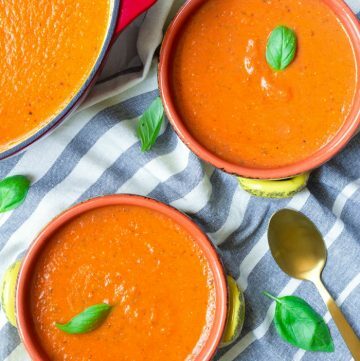 Heat 1-2 tablespoons olive oil on a large Dutch oven or a 5 quart oven-proof deep skillet with oven-proof lid over medium high heat. Cook marinated chicken thighs on both sides until golden brown, about 3-4 minutes per side (I usually start cooking skin side down first). Transfer to a plate. Chicken won’t be fully cooked at this point. Tip: give each side time to sear and develop a golden brown crust by not flipping too early. Remove any excess oil, without wiping the skillet clean as the brown bits from the chicken will be the flavor base for the rice. Add the onion and garlic, and cook until fragrant, about 2-3 minutes. Add rice and tomato paste, and stir to combine. Cook for 1 minute. Add can of Rotel tomatoes and chile (make sure it's drained), and stir to combine. Then add chicken broth and combine. Adjust salt and pepper if needed. Bring to a boil and nest chicken thighs on top of the rice. Cover with oven-proof lid, and transfer to oven and bake for 30-35 minutes. Then uncover and bake for another 10-15 minutes, until water is fully absorbed and top of slightly golden brown. Let it sit for 5-10 minutes (for the steam to escape). 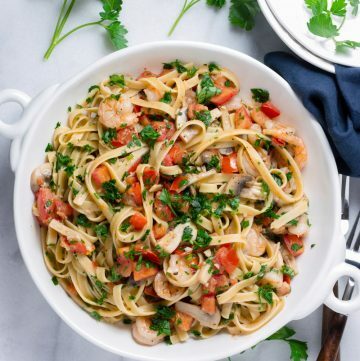 Garnish with parsley, queso fresco, and lime wedges. Enjoy!